If you have not yet encountered my Barbecue obsession…then hello and welcome to it. I was gifted a fantastic barbecue by my sister and although we have not yet invited anyone else to partake Skater and I have enjoyed a lot of barbecues so far. It’s been a long hot January for me. It started slowly with some sleep ins and a lot of catching up on cooking, reading and not rushing anywhere. The second week of January suddenly loomed and things sped up …a lot. I went back to work after what seemed like months off. In reality it was a little over a week, but it just goes to show you that I am starved of holiday time. Somewhere in that week off I managed to write or rework and photograph 5 BBQ recipes and 6 no bake dessert recipes. I know, but the fun and games did come to a screeching end when I returned to my day job. Still, I felt I got a few things done in the short space of time including cleaning out some cupboards and washing the car. Given the extent of my activities during the break I got a rather nasty surprise last week. It proved to me that no matter how much I think I have achieved, I may be just fooling myself. I need far more hours in a day to organise my life. I was rushing from one appointment to the next with the car as my office. The sun was blazing and each time I got in and out of the car it was like a pizza oven and I was getting whiplash trying to keep up with the temperature changes. Outside the car hot, inside the car furnace and then on with the air conditioning. Somewhere between morning tea and 2.45 pm I realized I was starving. When I stopped at the shops to pick up the mail I saw there was no line at Sydney’s most popular Banh Mi Store, Hong Ha bakery in Mascot. ( if you are not sure what a Banh Mi is check Lorraines Post). This is a rare occurrence, so I got me a Banh Mi and asked to have it cut in 1/2 so I could eat it on the way to my next appointment . This involved eating it in my car, and I always hate doing that, but you know I figured there was no choice. After re-adjusting the interior temperature from Pizza oven to air conditioned bliss, I took a couple of bites of my Banh Mi roll- (chicken with chilli), and was just about to slide it back into the paper bag when I noticed a tiny ant…and then another. They seemed to come out from under the hand brake, have a discussion and then together, they lifted up a crumb from the crispy Banh Mi roll, before hefting it back in the direction of the handbrake. Right there under my nose. Wildlife living in my car. Adjusted to the temperature and surviving on crumbs. It’s embarrassing and yet it’s also encouraging. When I park my car in the driveway tonight I hope those little fellas get to work cleaning up after me. ‘Cause heaven knows I don’t have enough time to do it my self. I am far too busy after work barbecuing The first thing Skater wanted when we got our Barbecue was Chicken Kebabs or skewers. I worked out a nice recipe that is smokey and sticky and we have eaten them at least 4 times in the last few weeks. 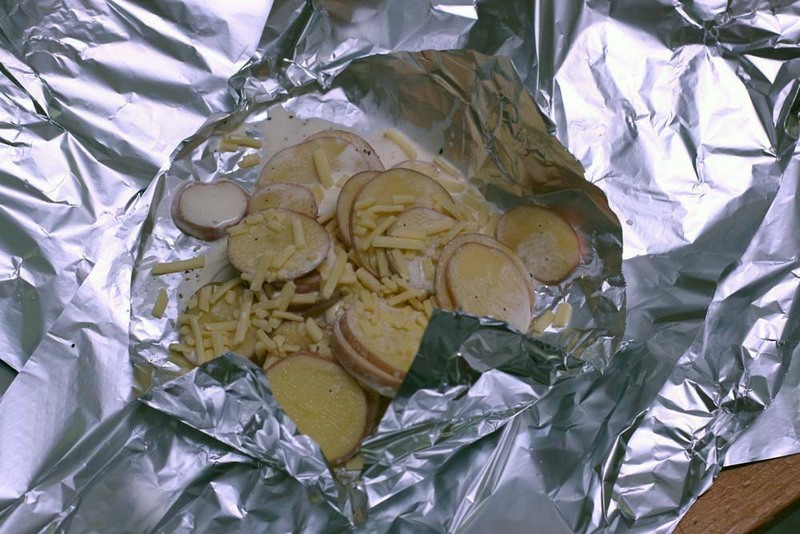 I’ve been working on cooking potato in a parcel too, just like you would cook it in the oven. If you don’t have a BBQ ( like I didn’t until recently), don’t worry you can cook these in a grill pan, in the oven or on even on the sandwich press. Cut the chicken breast into strips as even as possible. You will only get about 4 or even 5 strips from each breast. maybe more depending on the shape and size. Put the chicken into the marinade and stir around. 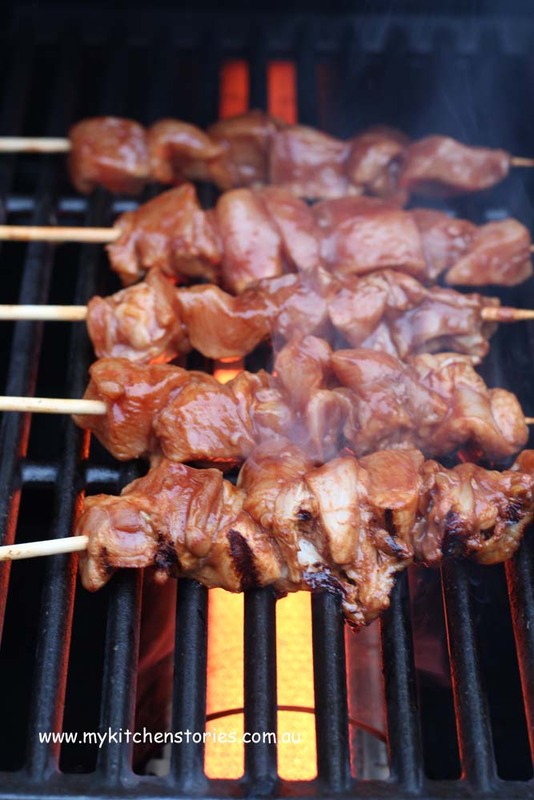 If you have a few minutes or longer leave the chicken to marinate, if not then begin to thread it on to the skewers. Start by threading the tip of the strip then folding into a S shape and threading till the skewer is 3/4 full. Continue with the other skewers. 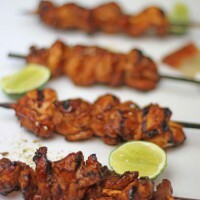 Coat the meat in any extra left over marinade or leave the skewers in the marinade overnight if you like. NEVER REUSE MARINADE AND DISCARD ANY THAT IS LEFT OVER. Cook the skewers on the hottest part of the BBQ. I use the grill bars. Put the chicken onto the grill and don't touch it for 5-8 minutes. After this time use a flat spatula to slide under the skewer and turn it over. Put the lid down and let it cook for approximately 6- 8 minutes. Test one with a small knife in the thickest part. Mix the extra sauce and cumin in a bowl and paint the skewers with this on there last turn. Give them a little bit of a turn to cook the sauce. This should make a nice sticky coating. Remove from the grill and put onto a plate. If you cook on the flat plate turn it down to medium when you turn over the skewers. Start the Potatoes first if cooking, they take up to 40 minutes. Lay out a big piece of foil and cover with a folded over piece of foil and then another piece on top of that going the opposite way to make a little container. Put the sliced potatoes onto this and spread out a little. Add the cream and the water and a sprinkle of grated cheese, salt and pepper. Fold over to hold in the liquid and put onto the grill before you prepare the chicken. Check carefully after 30 minutes because they are cooked with steam inside that parcel. They can take up to 40 minutes depending on how many potatoes and the heat of the grill. Mine was on full. When a recipe asks for light soy it doesn't mean it is low fat! There are a number of kinds of soy sauce in fact the list is immensely long as each country has their preferred style of soy sauce, so to simplify I am using a Chinese light soy. It is usually the most common in western supermarkets. Dark Chinese soy sauce is thicker, darker, less salty and a whole lot richer than light and often has added sugar, like molasses. Light soy sauce is more common in Chinese cooking, it is thinner and used in many dipping sauces and as a seasoning. A Japanese light soy can also be substituted here- Kikoman brand being the most common. 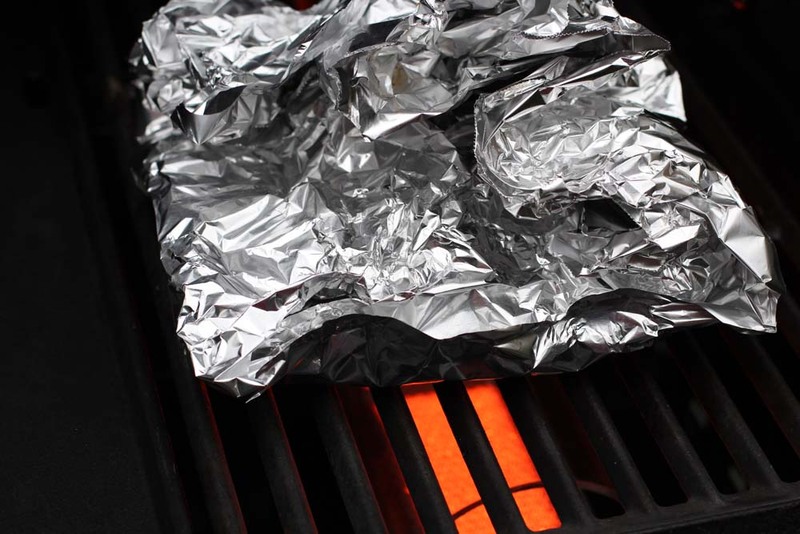 You can clean and lightly grease the grill bars of the BBQ by rubbing them with paper that has been lightly oiled. Have you had any embarrassing bug stories? 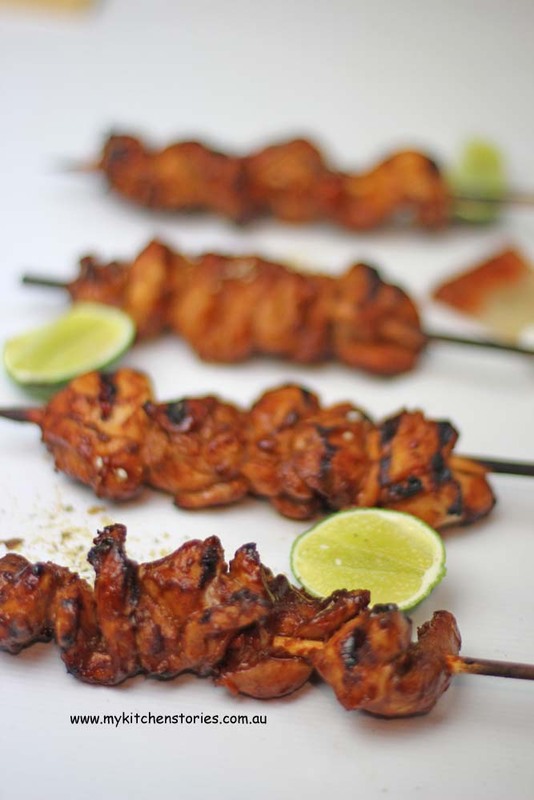 These kebabs seem easy to prepare and I love how they turned out…gorgeous colour. Loved the ant story. They are fascinating indeed–I love to watch the colonies in the fields near my house. I suspect there exists an underground city of epic proportions about which I haven’t a clue! Great recipe. I’ve always suspected I could eat cardboard if grilled and slathered with bbq sauce–luckily, I don’t have to. 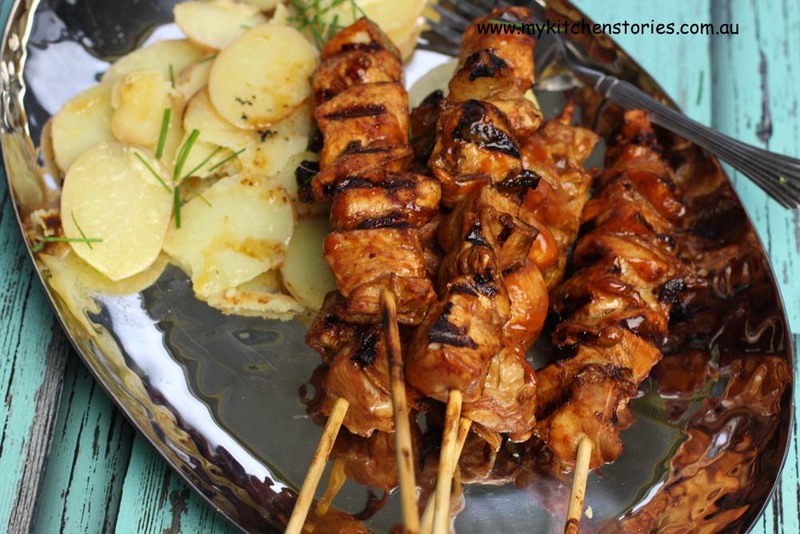 These kebabs look heavenly! Such great flavours! I love chicken kebabs! These look delicious and would be perfect for a weekend BBQ. And your first week of January sounds like bliss. 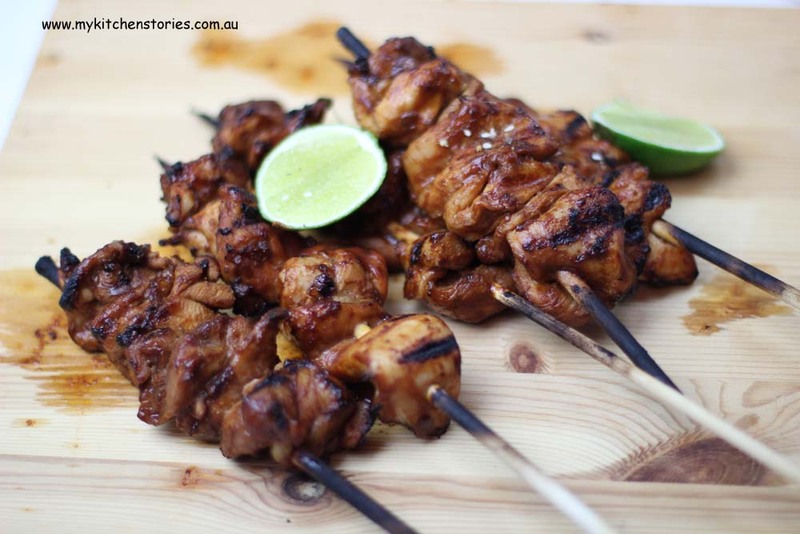 Yum, these kebabs are making my mouth water at 9.30am! Ants in the car, nice one! I had a spider once! And I’ve heard of people having possums too! As soon as I saw this, I must admit I skipped reading the post because I wanted to read the recipe asap! The flavours are RIGHT up my alley Tania. I love this! I love love LOVE BBQ-ing. I don’t have any marinades with just those ingredients, I use all those ingredients for BBQ marinades but they either swing towards Middle Eastern or Asian more. I really like what you’ve gone for! Thanks for the shout out T! And what a shock to find that in your car (and also that there was no queue at Hong Ha!). These skewers look fantastic. We want to get a bbq so that hubby can do some cooking but I’m worried that it will lay dormant! Oh how I love a good BBQ. What is it about it that makes the food taste so much better? Can’t wait to see the rest of your recipe and glad you had a little break. Yum – cumin and smoked paprika on chicken. Ants are clever little buggers aren’t they? I told Rich once he had bed bug bites on his back and it was actually shingles – does that qualify as a bug story? I didn’t qualify for Wife of the Year that’s for sure! tania what am i going to cook for dinner ? Great to hear that you have finally received a BBQ as I know it was on your wish list….and great to have in this weather. I am sure that Skater will become more interested in cooking too now you have one (I get my kids to do ALL the barbequing now – when they are home). I have only had spiders in my car (huntsman) and although they are harmless they give you a fright!! Well we can only hope thats the case Pamela. i would die of heart failure if I had a huntsman in the car!